With the assistance of a skilled team, we are engrossed in presenting a wide range of Employee Verification service to our customers. Rendered by some of the competent and experienced personnel of our crew, these offered services could be availed form us at market leading rates. More to this, these could be availed form us at market leading rates. We provides Marksheet/certificate verification services through University. A very specialised and a unique service targeted at tracing the professional whereabouts of ex-employees who may have been poached by competitors, may be building competing business on the side or selling trade secrets leading to potential loss of business and customer attrition for our clients. 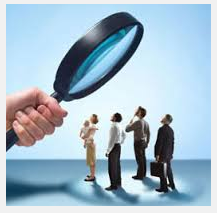 Our rigorous Employment Verification process identifies candidates who forge resumes in order to seek employment. Parconservices offers foolproof Services by confirming every registered candidates employment history and also obtains feedback from the candidates previous employers. Thus only sincere applicants enter our database and their authenticity is something we guarantee. Canny Management Services Pvt. Ltd. Pro Mentor do reference check on candidates prior to the interview on behalf of clients at no charges as add on services. This service is available exclusively on paid basis also.